We believe that your website should give your business an advantage online. If your existing website isn't performing well, or if you need help getting your new business online, then drop us a line. My name is Marc Patterson and I’m the founder of Patterson Consulting – a web development and training consultancy based in Galway, Ireland. After a 12 year career working as an IT consultant, building web applications for large businesses and government departments, I set up Patterson Consulting with the aim of delivering the same high quality, innovative websites at an affordable cost for all businesses regardless of their size or budget. At Patterson Consulting we specialise in building websites using web content management systems – software that lets you look after the content of your website yourself, with no need for learning nerdy code or having to employ a webmaster. This makes your website easy to update, more responsive to your changing business needs, with the flexibility to add in functionality such as blogs, shopping carts, social media, and more. Drop us a line and find out how we can help get your business online. We can assist you with every stage of your website project – whether it’s designing and building a brand new website for your business or extending and improving your existing website. We can help you with all the design aspects of your website – developing your brand identity (business name, logo, tagline, typography) or designing the user interface, structure and functionality of the website. Our graphic designers have over 15 years experience in designing eye-catching, feature-rich websites that work consistently across all devices – from desktops to mobile devices. We love building websites, and because we’re not tied to one particular technology, we can pick the right system for your business requirements – we don’t just re-package something we did for a previous customer! We prefer open source software like Drupal and WordPress, but we also have extensive experience in Microsoft technologies such as SharePoint and ASP.NET, and we are experts in OpenText Livelink WCM (aka Obtree). Our innovative content management solutions allow you to update your website yourself using your web browser, without any input from us. If you can use a word processor like Microsoft Word then you can use our content management solutions. But, if you do need our help, we’re only an email or a phone call away. Even if someone else built your website, we can help you with any issues that might crop up – we’ll not leave you stuck! Training and knowledge transfer are key components of all our projects. When we deliver a content management system to your business, we’ll give your staff all the training they need to update the website quickly and easily. Not only do we provide training to our clients, but as Certified Trainers, we also deliver courses in ASP.NET Web Development, SharePoint, and open source technologies such as MySQL, PHP, and Drupal. Here are just a few of the clients we’ve worked with recently. Most of our customers have come to us via personal recommendations from other clients, or via repeat business, which tells its own story. Click on a client name below to view a screenshot, or click here for our full list of clients. 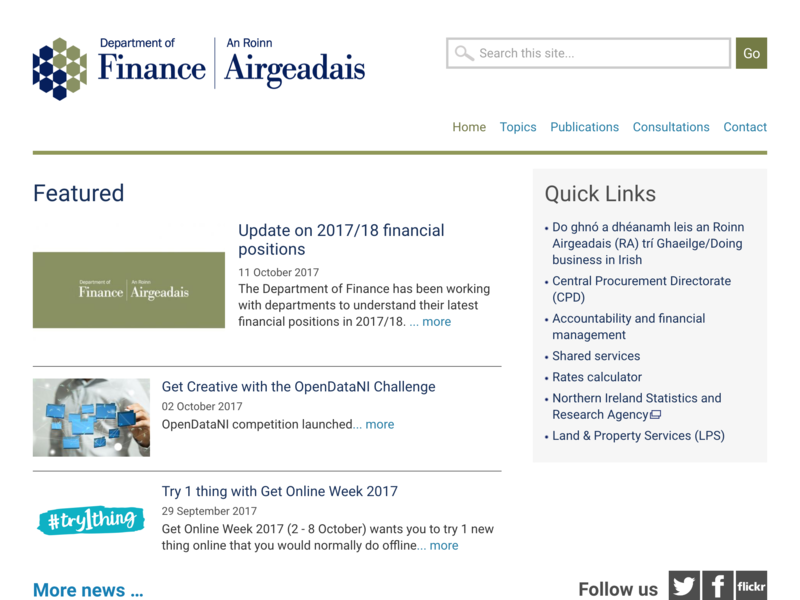 We have provided Drupal architectural services, development and training to the Department of Finance in Northern Ireland since 2015, helping them design and develop an enterprise-class Drupal platform for all NI government departmental and agency websites. The platform includes multi-lingual websites, multi-domain websites, and an intranet portal for all NI civil service staff. 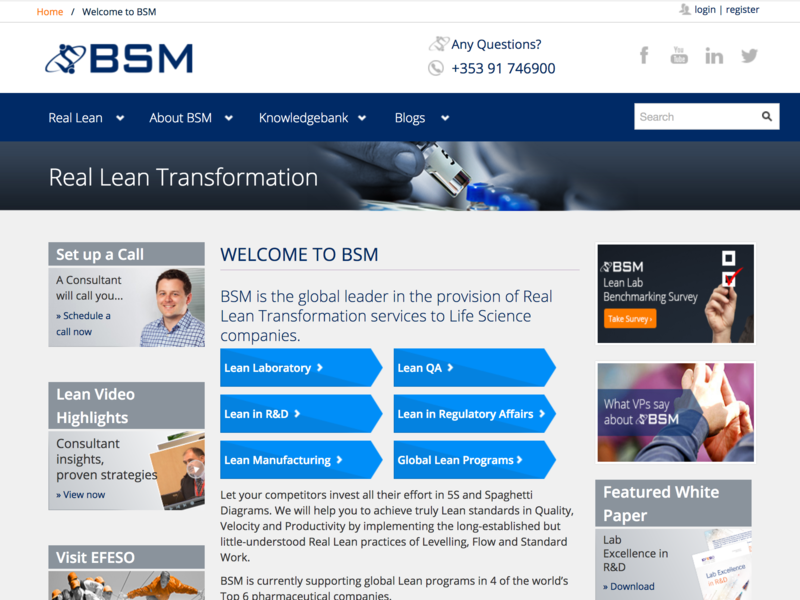 BSM, a Galway-based team of international lean consultants, were our first Drupal clients back in 2008. We have been their trusted web partners ever since – upgrading their original multi-domain website from Drupal 6 to a responsive design based on Drupal 7. We also developed a smaller Drupal website for their Lean Laboratory sub-brand and we continue to provide support and maintenance services. 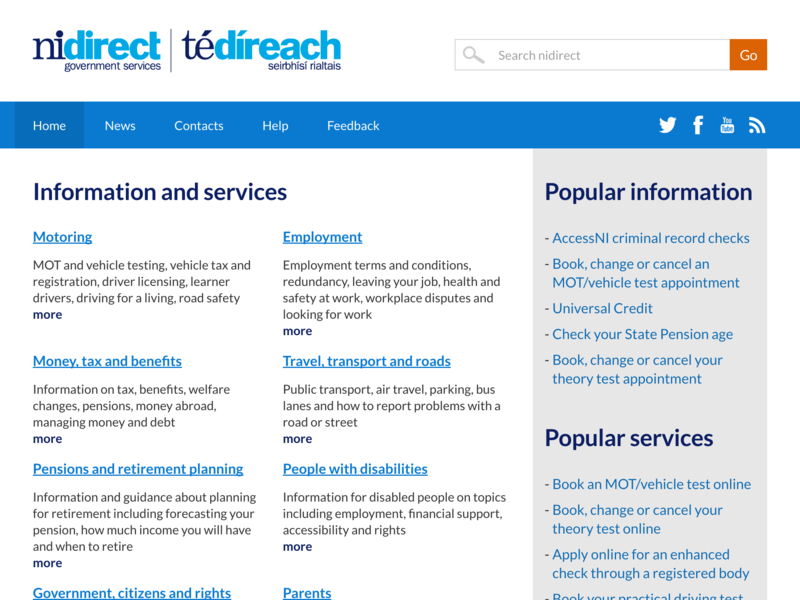 Nidirect is the official government website for Northern Ireland citizens and gets over 1 million unique visitors per week. We first worked with the Nidirect web team in 2008, helping them plan and build the initial website using OpenText Livelink. In 2015, we returned to help them build a new responsive website using Drupal and we are still providing support and helping them develop new functionality. 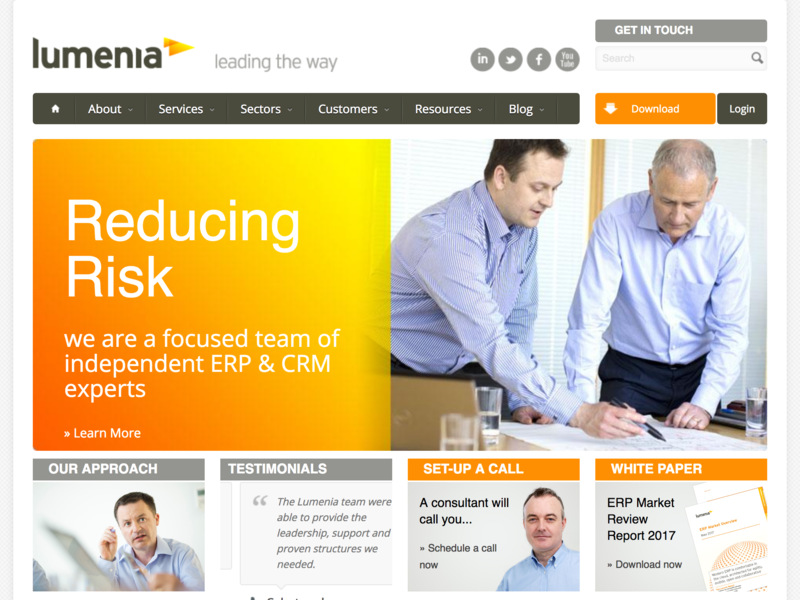 We’ve worked with Lumenia Consulting since the company was founded in 2013, building their original corporate website using Drupal and added new functionality to the website as their business has grown. We also developed a new Drupal 8 website for their biannual ERPHeadTOHead event and we continue to provide ongoing support and maintenance. 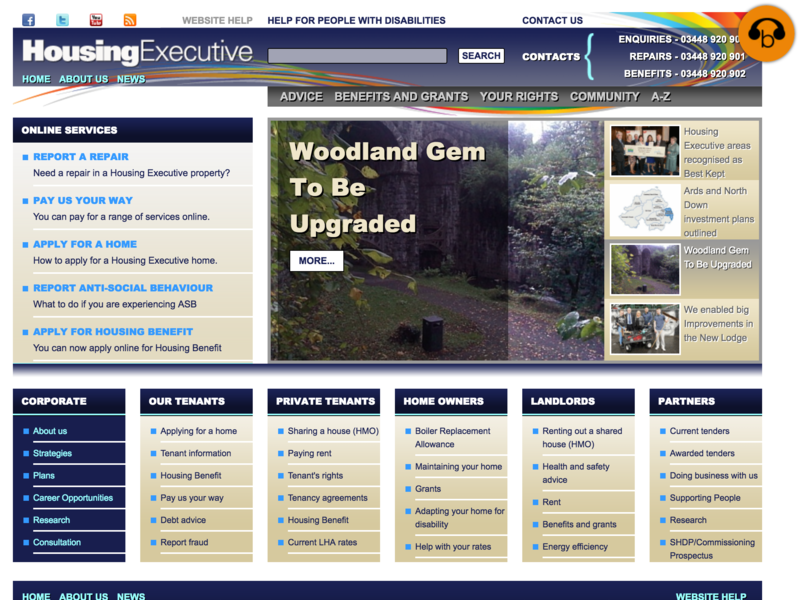 We’ve worked closely with the Housing Executive since 2008, initially supporting their legacy OpenText Livelink WCM website, then completely redesigning the website and building an awarding-winning mobile version. We have also developed bespoke ASP.NET web forms for NIHE and helped them customise their Microsoft SharePoint 2013 intranet portal. Over the past 6 years, our consultants have delivered MySQL and PHP developer training to long-term unemployed students, on behalf of FÁS (now SOLAS) – the Irish Government Further Education and Training Authority. Each course consists of between 14 and 20 weeks of full-time classroom-based training, leading to the award of Oracle Certified Professional MySQL 5.6 Developer. Check out our blog for more information on the course content. Fill in your details in the form below and we’ll get back to you as soon as possible.